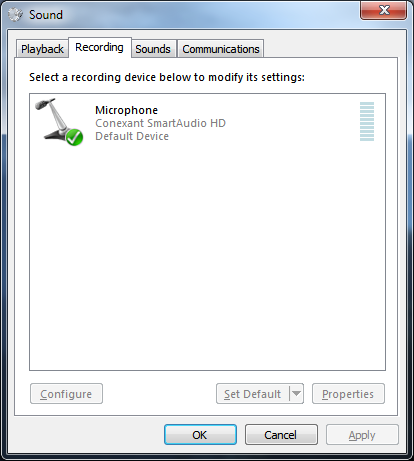 How can I record audio from a program I’m using in Windows 7? How can I record the audio from, say a flash .EXE game in Windows 7? There is no option of Stereo Mix in the audio devices in my laptop. I want to be able to record *any* sound that I can hear in my laptop, in good quality of-course. Is there any software for that? I would definitely check out Audacity. It can record audio and then you can edit the file too. It’s powerful and free! Any Video Recorder is a good choice. Freecorder 4 will allow you to record [b]anything that you hear[/b] on your computer and it's free. Google for a free download. Pratik, I found these out on the web, hope they can assist you a bit, give them a try. I would definitely check out Audacity. It can record audio and then you can edit the file too. It's powerful and free! More info: My Lenovo laptop is about 2 years old, having Windows 7 SP1, and a "Conexant SmartAudio HD" Audio device. Even after doing that, there is no stereo mix option. Hello, I have and old acer laptop running with windows 7 x64 that has the "conexant smart audio HD" audio device and this is the method I have used in the past whenever I want the stereo mix option to show. Of course it could depend in the rest of the hardware involved. I use Audacity. The default sound recorder from windows it lacks of features. -- once you have opened the program or file that contains sound you want recorded, click on start recording and that is it. Or you can download the free program Audacity, for more features and control.